Lowe joined the Harlequins academy in the summer of 2008 and made his Quins debut in the Premiership against Wasps in September 2009. He played for England under 20s at the Six Nations as well as the Junior World Championships in the summer of 2009. He became a regular starter for Quins during the 2010-2011 season was widely tipped to go on to represent England at senior level. 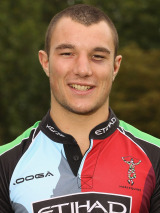 Lowe continued his charge for international honours during the 2011-12 season where he formed a lethal partnership in the Quins centres with Jordan Turner-Hall. Lowe capped a remarkable season with a spot in the ESPN Dream Team and looks set to be called up to the England squad for their tour of South Africa.